Ask any Belmont and he will tell you that count Dracula is a man of taste. Stroll through his ambient castle corridors, walk by his imposing library or listen to his melancholy harmony and you will feel the same way too. Were it not for the fact that the count keeps terrible company (death among others) the Belmonts would certainly consider living in his castle. It is a shame then that everytime a Belmont defeats the count his castle is destroyed with him. What a waste! Perhaps no Belmont appreciates Dracula's taste more than Juste. 50 years have passed since his grandfather Simon vanquished the count. And now he is whiling away his youth on a beautiful maiden Lydie. His best friend Maxim takes upon himself to find the remains of the count and destroy him once and for all. He seeks glory while his friend is indulging in pleasures. Things take a turn for the worse when Lydie is kidnapped. Maxim apprises Juste of the incident and the two set out together to find their friend. They are taken into Dracula's castle. It is not clear how it came into being but they don't care about the count at present. They just want to find Lydie unaware of the evil that is on the cusp of a resurrection. Harmony of dissonance does not feature count as the villain. He is latent. His power can be felt but he can not be seen. When Juste for the first time enters in the castle he is so taken in by it's ancient beauty that he decides to set up a room for himself in it. Maybe thinking that once the evil is destroyed it would be a waste to let this beautiful dwelling go. For this purpose he starts to collect the basic objects that a man needs to live. Scattered within the castle are things such as mirrors, dining tables, candle sticks etc. But all this exertion would be for nothing if he does not find Lydie. Therefore he explores each and every corner of the castle. Fights fearsome enemies and acquires amazing abilities. With each step getting closer to finding Lydie. Gameplay wise Harmony of dissonance builds upon the formula of the circle of the moon. Rather than cards that can be used to give different abilities, this time around it is the whip that is customizable which can be equipped with different end points. Most of them represent an element. So if a monster who is weak against ice is fought with the ice tipped whip it will deplete his health much faster. The crushing stone tip can used to open new pathways and it also allows the whip to be charged, mega man style, to deal hefty raw damage. Where as there is another tip that allows the whip to be rotated which is excellent for enemies with low hp that come in pairs. The secondary weapons are the same as in any castlevania game. But this time around spells can be attached to weapons which makes them super powerful. The spells use MP gauge which replenishes itself in time. Collectibles include every thing form the aforementioned tips to spells and equipment that enhance the base stats. Defeating enemies earns experience which is used to level up the character. Also scattered throughout are hint cards that offer valuable advice on the tricky areas in the castle. The star of the game however is the castle itself. It is a great experience traversing it little by little uncovering it's secrets and seeing what's next. During the middle portion of the game both the castles are available and the puzzles get more complex with acts in one part of the castle affecting the areas of another. It can get a bit tricky sometimes to guess where to go next. The backgrounds are rich and haunting. In addition to building an atmosphere they help in subtle ways to convey the story. 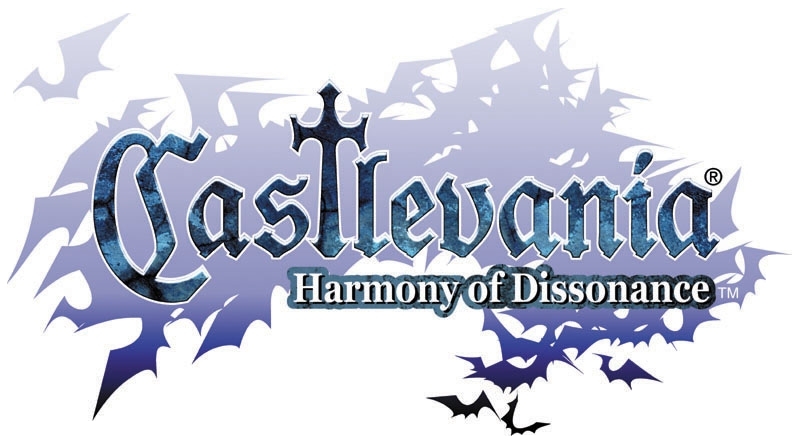 As expected the written parts of the game are a bit weak in conveying the story but it is more than compensated for in the visual department .The score is well composed too, though it can be a little disappointing to hear the 16 bit blips and bloops instead of the rich orchestra that castlevania games are famous for. The game is probably the smoothest castlevania that I have experienced. Left and right triggers allow you to dash which makes traversing the castle a joy. Other controls like jumping and using magic are smooth as well and I always felt in total control of Juste. He is without a doubt the most agile Belmont. There is very little that can be said against Harmony of dissonance. It is a classic metroidvania game. It has a great atmosphere and is a perfect game to play on a slightly chilly Halloween night. Don't miss the opportunity to play it again even if you have beaten it years ago on your gameboy.